Packed with healthy snack options with a wide variety to satisfy everyone! Full size options - not just one or two bite samples. 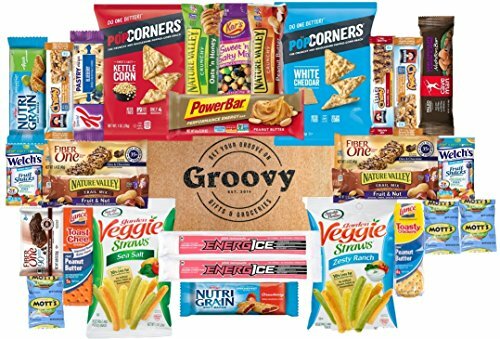 The Groove Box is the perfect gift for the busy mom, dad, friend and college university student in your life. Going on a road trip? This is the perfect solution for he road trip blues. Save money and avoid those highway temptations. Get that college University student ready for a new semester and fuel them for finals with these hand-picked treats. Items from your favorite brands are sure to be a big hit among them, their friends and study groups. Great for guys, girls, teens, kids or just about anyone. Send a Groove Box to a friend, family member, military personnel, or even yourself! Groove Box is also a great gift for birthdays, holidays, or just because! Perfect for Military Care Packages - don't worry about melting - these delicious treats will be a hit! If you have any questions about this product by Groove Box, contact us by completing and submitting the form below. If you are looking for a specif part number, please include it with your message.